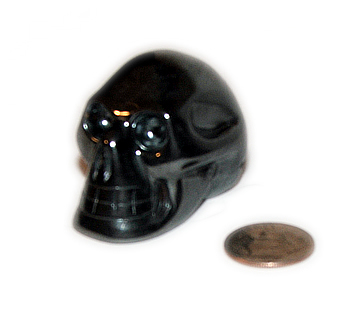 Each skull is hand carved from geniune hematite. Hematite is a heavy stone with a shiny silverish black appearance and possesses magnetic properties. It is known for certain healing powers relating to blood related illnesses which may include; anemia, cardivasuclar disease, and even menstrual cramps. Since each skull is hand carved, skulls vary slightly in size and shape. Measures aprox 1" from jaw to back of skull.